Tuesday’s analysis is delayed on account of the seizure I suffered on seeing one of the wagers. Choyon looked like his timing was off today, and he should be out of contention. HOWEVER… I’m just going to skip to what actually happened. I really have no idea what Dan is doing here. At least he left himself a dollar, unlike Christina McTighe back in February; that puts him in line with Damian Henri (who was the subject of the infamous post-gym video). You might recall I recently changed the colors for my really really bad wagers. Dan gets the new “Cliff Clavin” mark because he allows a mathematically-eliminated player back into contention. If Lenny makes the proper all-in wager and everyone misses, Choyon wins his fourth match. 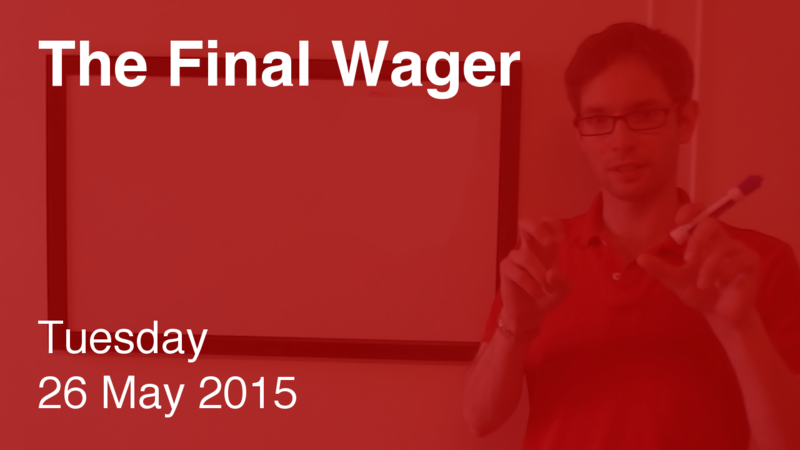 What should Dan have wagered? Well… I’ll leave you to derive those calculations from the numbers above, but at the absolute most he could have wagered 13,399. What is the olive tree? Did you notice that the answers in the Numbers category all coincided with their dollar value? (200 for passing go, The 400 Blows, etc) If the players ran the categories top to bottom as the Jeopardy! gods intended, they might’ve noticed that!